$175 million will support the 7th Street Grade Separation Project (East), which will replace an existing railroad underpass between I-880 and Maritime Street to increase clearance for trucks, alleviating a major chokepoint for intercontinental rail and drayage trucks, and improve a shared pedestrian/bicycle pathway. A second grant of $12.4 million will fund the Freight Intelligent Transportation System (ITS) to implement technology to manage truck arrivals, improve incident response and connect to regional smart corridor systems. The ITS project will include backbone communications infrastructure and systems integration and lays the technological foundation to support future developments in truck and connected vehicle technologies. Together, these projects will improve freight efficiencies, maintain and expand the Port's market and operational competitiveness, and support local, regional, state and national economic development and Port growth potential. The GoPort projects will improve the efficiency, safety and reliability of truck and rail access and circulation within and near the Port. These improvements will reduce impacts on local communities by accommodating anticipated truck and rail on Port property rather than spillover on local streets, and the overall Port circulation efficiencies expected from the projects will help to reduce emissions in West Oakland. The project also includes improved bike and pedestrian safety with a modernized trail that will connect to Middle Harbor Shoreline Park and the Bay Trail. "These projects will improve reliability of travel time and access throughout the Port of Oakland, increasing efficiency, while reducing congestion and air quality impacts on the local community and eliminating truck back-ups onto local streets," says Alameda CTC Chair Supervisor Richard Valle. "They also support increased use of rail, which is a key part of the region's and county's goods movement strategy." GoPort was identified as a priority in both the Alameda County and the Metropolitan Transportation Commission's Goods Movement Plans (adopted in 2017), and was included in the region's Plan Bay Area 2040. "Collectively the GoPort projects will significantly improve Port efficiencies, thereby increasing the competitiveness of the Port in the global market while also significantly reducing impacts to the local community," says J. Christopher Lytle, Executive Director of the Port of Oakland. "These gas tax funds (SB1) will be serving a critical role to reduce freight congestion on freeways and rail lines, reducing emissions and improving air quality and good jobs," added Alameda CTC Executive Director Arthur L. Dao. "While our local transportation sales tax measures got these projects underway, and serve as key leverage, we wouldn't be able to move forward into construction on these priority projects without the statewide gas tax funds." 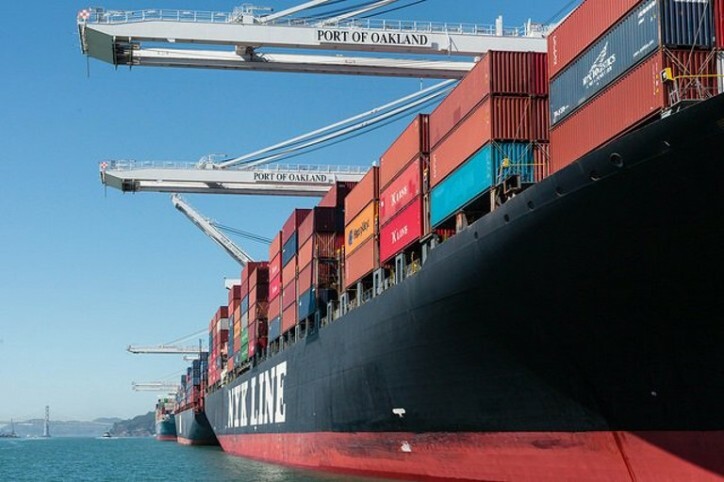 Additionally, the Port of Oakland and its largest marine terminal operator, Oakland International Container Terminal are seeking to partner with the Bay Area Air Quality Management Districton an innovative program to upgrade and replace the heavy-duty diesel engines on all of their landside container handling cranes with hybrid battery-electric engines. If grant funding is approved, this nearly $6 million upgrade will reduce criteria pollutant emissions from these cranes by nearly 99% from their current levels and will serve as an important step in the introduction of near-zero and zero emissions equipment throughout the Port of Oakland's operations.